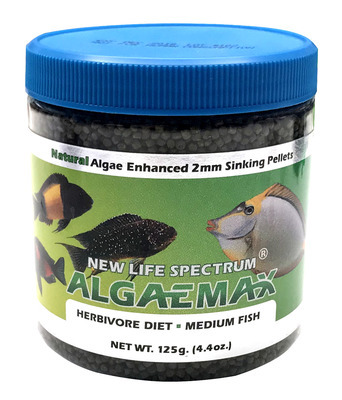 New Life Spectrum�AlgaeMax fish food. Natural Algae enhanced 2mm sinking pellet. Includes large quantities of a wide variety of natural algae and seaweed. Perfect complete diet for herbivore species. Spectrum high density, high nutrition formula can maintain colour and vitality in all types of tropical aquarium fish. Suitable for both marine and freshwater tropical fish.